Kenya Tea Development Agency (KTDA), has announced Sh63.6 billion in farmers’ earnings for the 2014-2015 financial year, which represents a 21percent jump from the Sh 52.6 billion earned in the 2013 – 2014 financial year. 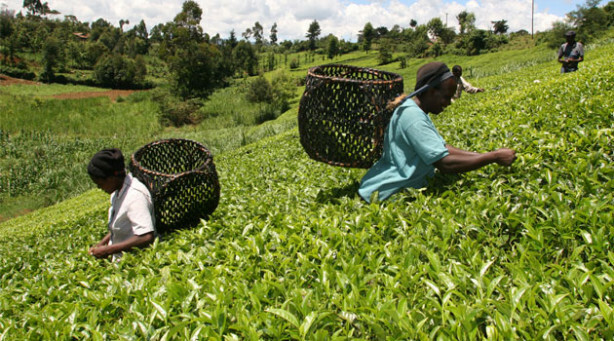 Of the Sh 63.6 billion, Sh 43.25 billion will be paid out to smallholder tea farmers as bonuses. Sh 14.55 billion has already been paid out monthly to farmers as Initial Payment, based on monthly green leaf deliveries to factories, at the rate of Sh 14 per kilo of green leaf. The balance will now be released as Second Payment, commonly referred to as ‘bonus’, and will be paid out in October. The ‘bonus’ will be paid at an average rate of Sh 27.61per kg of green leaf, representing a 56.8 percent increase over the 2013-2014 average rate of Sh 17.61 per kg of green leaf. KTDA Group CEO, Lerionka Tiampati, said the improved earnings are as a result of lower tea supply in the second half of the financial year as well as improved tea prices and favourable exchange rates. Low supply especially in the first half of 2015 was caused by a prolonged drought earlier in the year, where production dropped by 6percent, pushing up auction prices. However, from the start of this calendar year to date, production has gone down by 30percent. Price of tea at the auction averaged USD 2.60 in the 2014/15 financial year, up from an average of USD 2.43 in the 2013/14 year, a 7 percent increase. Tea prices have reached highs of over USD 4 per kg of made tea for some primary grades at recent auctions during the current financial year. The weakening of the Kenyan shilling against the dollar has also boosted farmers’ earnings because tea exports are paid in dollars. Kenya exports as more than 95percent of its made tea. The average exchange rate of the dollar so far this year has been Sh91 against Sh87 same time last year, a 4.6percent improvement. A total of 240 million kilograms of made tea was made from 1.039 billion kilograms of green leaf delivered to the factories during the financial year under consideration, compared to a total of 256 million kilograms of made tea from 1.124 billion kilograms of green leaf delivered to the factories during the 2013/14 financial year. This represents a 6.3percent drop in made tea production. It takes on average 4 kgs of green leaf to make 1 kg of made tea. There was marginal improvement in sales volumes occasioned by large stock carry over from last year. “Overall, factories are paying an average 71% of total earnings to the farmers compared to 67percent per cent last year,” said Mr. Tiampati. The average net income to the farmer has been rising over the years, reflecting an overall improvement in efficiency and cost management at the factory level, the MD said. Commenting on the reduced earnings in the previous year, Mr Tiampati noted that huge production was a key factor that caused prices at the auctions to drop last year. In spite of the improved performance, the Agency still faces challenges in producing and marketing Kenyan tea. “Cost of production has continued to rise due to high energy, labour, financing and transport costs. Energy is still the single largest contributor to the cost of production. To manage these challenges, KTDA has focused on cost management and efficiency enhancement. We are leveraging on economies of scale in order to negotiate cheaper input purchases for smallholder farmers,” he added. In particular, the Agency has invested in a number of small hydro-power stations that are expected to lower energy costs in a number of KTDA-managed factories. “Our new 230,000-square foot warehouse being built in Mombasa will offer centralized and cheaper storage facilities to KTDA-managed factories, which will significantly lower costs for our factories. We expect the warehouses to be commissioned early 2016,” noted Tiampati. Recently, KTDA procured 77,050 metric tonnes of fertilizer for farmers at competitive rates, marking yet another milestone this year.